This arrangement © Jan. 2015 MusicEssence, a divison of Encounter Music & Creative Services. Original composition in public domain. https://blcasey.wordpress.com/musicessence. ASCAP # 1777913 / 0163928. All rights reserved. To inquire about the work, e-mail blcasey@att.net. The melody line is in three parts: oboe, muted trumpet, and tenor solo. If tenor soloist is not used, muted trumpet or cornet is the optimum choice. At the discretion of the conductor, oboe may be used with tenor soloist or with muted trumpet. In making decisions for this setting, I considered musical, textual, and vocal facets. Where possible, without doing violence to the composer’s music, I have matched agogic and metric accents with emphatic, accented, and/or significant words and syllables. There is often room for artful adjustment in such aspects as syllabic setting; I am open to suggestion. The original Grechaninov setting would have used either the traditional Latin text (see #5 below) or a Russian translation. The edition from which I worked had only N. Lindsay Norden’s English translation. The relationship of the Russian (Cyrillic) and Greek alphabets is well known, but my decision to promote and prefer the Greek text here has nothing to do with that; rather, my strong interest in the original Greek language used in both the Septuagint (Greek translation of the Tanakh or “Old Testament”) and the first-century CE documents that became the “New Testament” led to a return to the most authoritative Greek text available today: the current edition of the Nestle-Aland text, commonly known as NA28. The English transliteration of the Greek is based on my own ongoing study of the Koiné Greek language, and it uses slightly adapted International Phonetic Alphabet syllables, known to trained singers and linguists. I acknowledge that the idea of “accurate” pronunciations of Koiné Greek is somewhat elusive, in view of the chronological distance and the fact that Koiné per se is no longer spoken, but I have followed one generally accepted school of thought with reference to pronunciation — and specifically, to vowels such as omicron/omega and epsilon/eta. 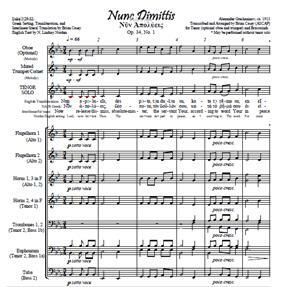 I acknowledge that the Latin from which traditional “Nunc Dimittis” musical settings are derived is more “singable,” because of a) Latin’s relative simplicity in terms of vowel and consonant phonemes, and b) the familiarity of most trained singers with Latin and Italian. Any Latin setting by the composer, however, is not readily available—another reason for the Greek here. The Latin from the Clementine Vulgate edition (1592) is as follows: Nunc dimittis servum tuum Domine, secundum verbum tuum in pace: quia viderunt oculi mei salutare tuum, quod parasti ante faciem omnium populorum: lumen ad revelationem gentium, et gloriam plebis tuæ Israël. This Latin is not included (and the Norden English is in smaller type) in the hope that performers will accept the worthwhile challenge of singing the Greek. The notice below is set to appear in the College Band Directors National Association’s CBDNA Report, fall 2015. The Sheridan College/Community Wind Ensemble premiered Dr. Brian Casey’s arrangement of Alexander Grechaninov’s Nunc Dimittis on April 4, 2015, with Casey conducting. Not a transcription but an adaptation of the 8-part choral original, this version is for tenor voice with ten brass. Tenor soloist was Mr. Philip Garber, a Big Horn, Wyoming native and an alumnus of Casper College and the University of Nevada, Las Vegas. Garber had previously toured with the American Wind Symphony Orchestra as technical director. Grechaninov’s setting of the text known as “Simeon’s Song” (Luke 2), ca. 1913, is less than two minutes long, yet glorious. The instrumental sonorities in this arrangement emphasize conical brass (flugelhorns or cornets preferred). Solo oboe and/or solo muted trumpet may be added to, or substituted for, the tenor voice. Accompaniment instrumentation is two flugelhorns/cornets, three horns, two trombones, two euphoniums, and tuba. As for the text, Grechaninov would likely have used Latin or Russian, but no edition with either of those languages was available. Nor is any ancient manuscript available with the Hebrew or Aramaic that would have been spoken by Simeon himself, so the arranger chose to wed the music with the most ancient available text: the current scholarly edition of the Nestle-Aland Greek text (NA28). In addition to the Greek, this arrangement provides an English text that might be performed. 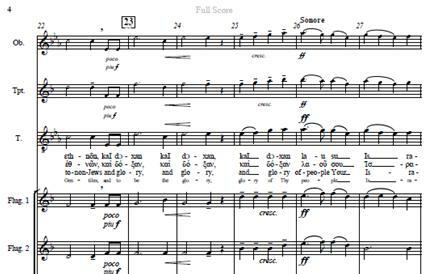 Also featured are a reputable pronunciation scheme (with English transliteration for ease) and an interlinear translation so the singer and conductor may readily recognize the peaks and verbal emphases. The setting aims to balance musical concerns and aspects of the vocal line with conceptual and linguistic/textual considerations.